Safety Briefing/Meeting/Discussion at 7:10 PM. All, new to me, shooters must attend safety briefing. Costco Pizza at 8:30 as contest begins. Show and Tell time is always enjoyable, please let us know what you are bringing. Rifles – The only permitted rifles must be of handgun caliber (9mm, .40, .357, 5.7mm, etc… are acceptable). ARs/AKs of the 22lr variant are also welcome. Shotguns – Are NOW permitted provided that you purchase and use range ammunition. Cost – ONLY $10, stay and shoot as long as you want! 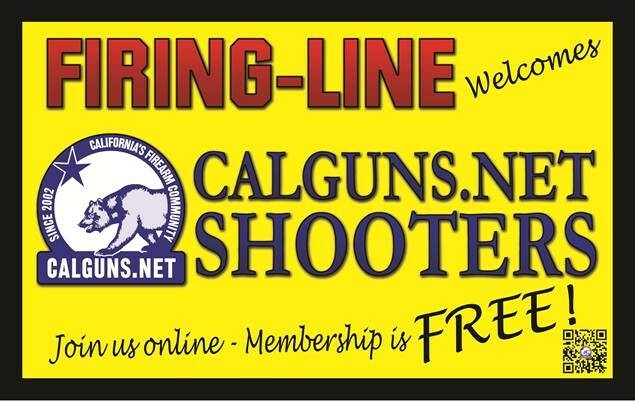 ** Firing Line members are free to attend. REMINDER: – When you’re there your actions represent the entire Calguns community. We should always take responsibility for our actions, and treat their facility with the utmost respect. As usual, we’ll be able to utilize their training room to eat dinner, hangout, chit-chat, do some show and tell, and purchase swag. In addition, they will be reserving an entire side of the range for us, and depending on the turnout we may have to take turns and/or expand into the other range. We’ll also be providing fabulous Costco pizza at 8:30 PM or so for anyone that is hungry and wants to eat. So, who’s in? You know there is nothing better that you’d rather do on a Friday night than shoot some guns with fellow CalGunners!